I hope everyone is enjoying the iPhoneInCanada.ca giveaway this month! We have a ton of prizes from a ton of very generous companies and X1Zero’s Corner will be no different! Today we have a review of the “Gel-Shellz” made by our Canadian friends over at Helium Digital! 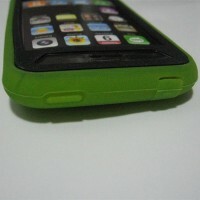 The Gel-Shellz are a premium silicone protection solution made for the iPhone 3G. 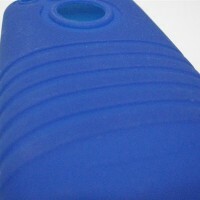 The silicone is very soft yet thick so to offer superior impact protection, while the sides of the case have a micro texture design that provides a comfortable, non-slip grip. 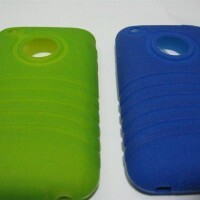 Gel-Shellz come in a variety of colors, however the review today will be on the Blue and Green colors and both tones provide a very attractive way to protect your iPhone 3G. The Gel-Shellz have cut outs for the iPhones headphone jack, screen sensors, speaker/mic, dock port, camera and the Apple Logo on the back. A nice added bonus is the headphone and dock cutouts have plugs to keep dirt and dust out when not using either of the ports. 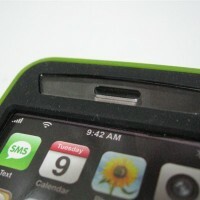 The other nice little bonus offered by the Gel-Shellz are clear plastic pieces that come as part of the case. 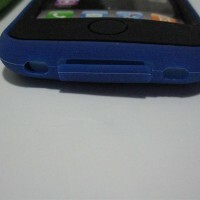 The first plastic plug covers the Apple logo on the back but still keeps the logo visible and the second plug covers the screen sensors but since the plastic is clear, the sensors will still work properly. It is interesting to point out that I am seeing these plastic add-ons more and more on silicone cases these days and while some of you may not find them necessary, they are a nice extra to include because it helps with covering up the extra cut-outs but still keeping them protected. Overall, I like the Gel-Shellz. 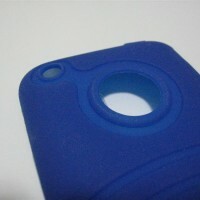 I like the design on the back that surrounds the cut-outs and the design along the lower back of the case as well. 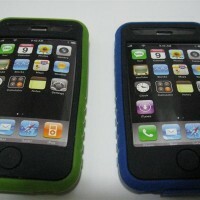 Moreover, the black on blue and the black on green look fantastic especially because the black provides a nice accent to the cases and gives them a very finished look. 1.) Type out one or two sentences about the iPhone but with the words “Helium” and “Digital” in it (but NOT beside each other), as well as your color preference between the two cases above. Contest ends Tuesday January 27 at 11:59pm.